Museum in a Box allows you to bring a museum into your classroom. 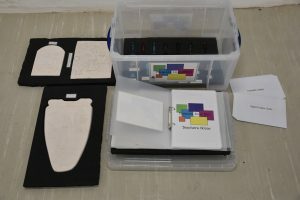 In the box, you will find everything you need to curate your own Egyptology Exhibition. The loan box allows pupils to engage with the Egypt Centre’s collection in a way that will enrich and support their learning. The Museum in a Box service will enable pupils to learn about the ancient Egyptians and how we perceive them today. The Box facilitates the developments of several key skill areas as well as tying in to several areas of the National Curriculum. Boxes cost £5 a week. Boxes can be collected from the Egypt Centre for free or delivered to the organisation for a postage fee. We have plans to create more loan boxes. If you wish to submit an idea you feel would support your work, please contact the Education Officer.